A female case worker was killed and a doctor shot when a psychiatric patient opened fire on them Thursday in a wellness center on the campus of a Delaware County, Pennsylvania, hospital, officials say. Officials say that patient was then shot by the doctor, who returned fire from his own gun. The shootout took place around 2:20 p.m. Thursday inside a doctor's office in the psychiatric unit at the Sister Marie Lenahan Wellness Center, officials say. The center is located along the 1500 block of Lansdowne Avenue in Darby, Pa. That's located across from Mercy-Fitzgerald hospital, on its campus. 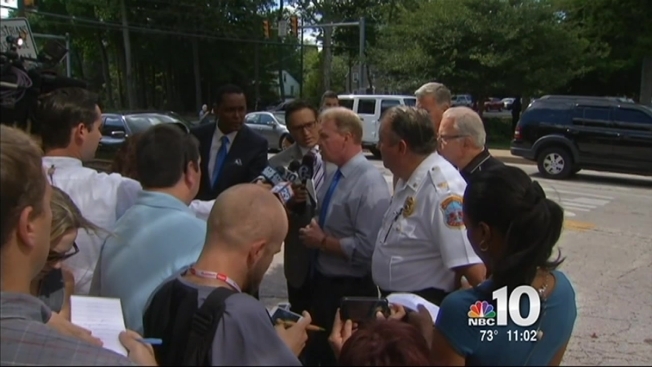 The gunman, identified as Richard Plotts, of Upper Darby, had come to the unit with his caseworker, 53-year-old Theresa Hunt of Philadelphia, according to Delaware County District Attorney Jack Whelan. They then went behind closed doors in a doctor's third floor office when a confrontation occurred. “A worker did confirm that he heard some loud arguing going on. They came in and they actually opened the door and saw him pointing a gun at the doctor. They did not notice the case worker at that point. They shut the door very quietly and one immediately called 911," Whelan said. The DA said a short time went by and then gunfire erupted from Plotts' gun. Plotts has had run-ins with the doctor's and hospital staff in the past, Whelan said. Both the doctor, identified as Dr. Lee Silverman, and the case worker were hit by the gunfire. The woman was fatally shot in the small office, and the doctor was grazed in the head, Whelan said. Silverman also pulled out his weapon and fired upon the suspect, the preliminary investigation showed. Plotts was hit three times in the torso, Whelan said. Other doctors and case workers then rushed into the room and tackled the man to the ground, wrestling with him for the weapon. “We’re not exactly sure what had occurred and what might have precipitated this particular incident," Whelan said. "We do know the psychiatric connection, we have that concern, however we don’t know if there was another dispute that occurred inside that room that led to these shots being fired." The wellness center shooting suspect, Richard Plotts, has had multiple, "turbulent interactions" with staff at Mercy-Fitzgerald, according to District Attorney Jack Whelan. NBC10's George Spencer has more. Both Plotts and Silverman were taken to the trauma center at the Hospital of the University of Pennsylvania in nearby Philadelphia. The suspect is in surgery and is listed in critical condition, Whelan said. The doctor's condition has not been released. Officials say a 911 call came in at 2:19 p.m. with the caller saying a doctor had been shot. The center and hospital was quickly placed on lockdown as police swarmed the campus. Allen Williams was checking in his father for an X-ray on the center's ground floor when the shooting happened. "As we were giving the information, they said the hospital is on lockdown and they locked out the doors. They told us to sneak out the back door," he said. “I was hoping everyone was going to get out safe." Williams slowly led his father, who uses a walker, in a group of 15 people onto a grassy area outside the building. He says police kept them at the scene as they checked the building. Police arrived within minutes and evacuated the entire wellness center as SWAT officers swept the building as a precaution. The Sister Marie Lenahan Wellness Center has physician offices and offers outpatient services for ambulatory care, audiology, cardiac rehabilitation, radiology and hearing and balance, according to the health system's website. "We continue to pray for the victims and their families. As this is an ongoing investigation, we remain focused on working with the Delaware County Police Departments to understand fully the details of the event and to do all we can to assist those affected. We are thankful for the responders to this incident, the many law enforcement professionals who are a part of the investigation, and the outpouring of support we have received from our community." A large police presence from Yeadon, Haverford Township and other Delaware County law enforcement agencies remained at the scene for hours as the crime scene was processed. Contact Vince Lattanzio at 610.668.5532, vince.lattanzio@nbcuni.com or follow @VinceLattanzio on Twitter.